Sharon Rudnick was recently named “Product Liability Lawyer of the Year in Oregon” in 2013 by Global Law Experts. Global Law Experts is an international directory, which grants awards to only one attorney from each jurisdiction in each key practice area. Thereby, Sharon is the only Oregon attorney to receive this award and distinction. For 30 years, Sharon has handled business disputes, class action claims, product liability claims, and labor and employment matters. Sharon was recently at the forefront of national litigation concerning punitive damages and U.S. constitutional law and has successfully handled many high-profile product liability cases for major corporations. 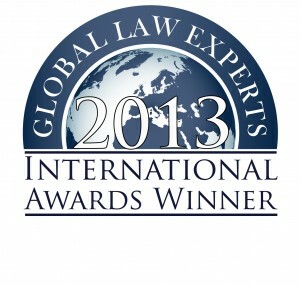 Global Law Experts (GLE) is the premier guide to leading attorneys throughout the world. They are the only organization to recommend just one legal expert in each key practice area and country. They do this to avoid repetition, competition, and extensive comparative research when selecting external legal counsel. All GLE endorsed lawyers must be either recommended, personally apply, or be selected by Global Law Experts’ research department before they are given the opportunity to feature and be profiled on the website. Applicants go through an intensive research process before being passed onto the Nominations Panel for final assessment and validation. Only then are lawyers invited to join Global Law Experts and thus be endorsed by GLE. Global Law Experts now recommends nearly 2,000 lawyers from 140 countries in 30 practice areas. Global Law Experts looks at the independent lawyers and law firms as well as the full service ‘big players’ in the market to showcase an in-depth cross section of quality international advisers to suit a variety needs and budgets.